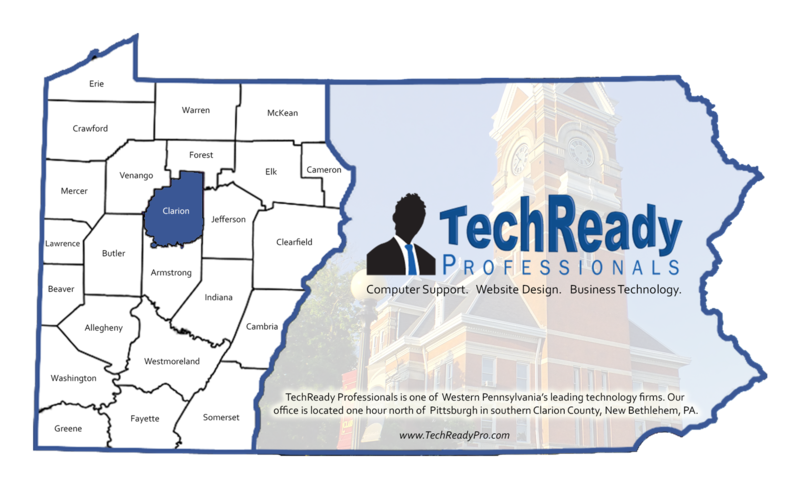 TechReady is Clarion County’s leading Computer Repair firm, serving Clarion PA and Western Pennsylvania. TechReady is a full-service technology firm offering Computer Repair Clarion County and Computer Networking Clarion County services to homeowners and businesses throughout Western Pennsylvania. Our team also offers virus removal and computer networking for ALL your Clarion computer support needs. We offer virus removal, computer networking, computer training and computer support to Clarion County. TechReady’s team of technology professionals serve Western Pennsylvania, including local homeowners and businesses with Computer Repair Clarion County, Computer Repair Jefferson County, and Computer Repair Armstrong County. Our team offers Computer Repair Jefferson County and Computer Repair Armstrong County.